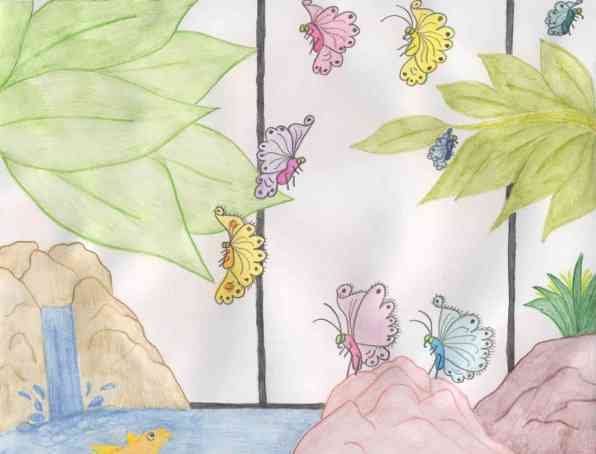 The butterflies had flown only a short distance when they came upon a small village, built on the hillside. "That’s a nice wee town," Bonnie said. "It’s surrounded by trees, has a river flowing next to it and is very quaint. I wonder what village it is. I’m sure you know, don’t you, Mr. Walking Encyclopedia?" "Well, as a matter of fact, I do know its name. The village is Lasswade. The river is the River North Esk," Bruce said, hesitatingly. "I knew you’d have an answer," Bonnie scoffed. "There used to be paper and flour mills here and even once a carpet factory. A long time ago Sir Walter Scott stayed here for several years," Bruce continued. "It is a nice little place. What’s that over there?" Bonnie asked, pointing to a large greenhouse. "I’m not sure. Why don’t we go and find out?" They flew towards it and landed on the roof. "It’s called the Edinburgh Insect and Butterfly House and it’s filled with butterflies. That’s odd. It’s a house for butterflies?" Bonnie asked. She looked in through the roof and then looked again. "There are waterfalls and pools with tropical fish and, oh, I see a big lizard. It’s green and quite ugly. What do you think butterflies are doing in there?" She was curious. "It says it’s a butterfly and insect house. They live here. I see them all too," he said, gazing down through the roof. We might as well go inside," Bruce suggested. They flew around the greenhouse. "I don’t see a way in," Bonnie sighed. Just then some people pulled up in a car and went inside the butterfly house. "Let’s follow them," she said, "quickly." They flew in the door and it slammed shut behind them. "Whew, that was close. WOW!" Bruce cried. "This is beautiful. Look at all the colorful butterflies. I feel like I’m in a rainforest!" Bonnie flew over to a pool and looked at the fish. "How beautiful! I’ve never seen fish that looked like this before." "Don’t get too close. Remember the last encounter with a fish," Bruce reminded her. "Look at all the different colors of green," Bonnie marveled. Children walked around below, pointing at the butterflies. One of them spotted the iguana. "There’s the big lizard," Bruce said. "That boy is going to pet it. Yikes!" "I don’t think it’s dangerous. They wouldn’t keep it in here with all these butterflies if it were. It probably eats fruit and vegetables, not butterflies," Bonnie pointed out. "You’re right. Let’s go down and look," Bruce said. They flew down and landed on a rock near the iguana and the children. The boy was stroking its back. The lizards tongue darted in and out of its mouth. Bonnie looked around. There were purple butterflies. There were blue, green, orange, red and yellow butterflies. There were striped ones and ones with big colorful dots on them. Bonnie spotted a frog. "Look over there," she said. "It’s a frog. I wonder if its one of those poisonous ones." "Let’s not find out. Leave the frog alone, Bonnie," Bruce warned. "I will. Don’t worry. Frogs eat bugs. They eat flies and butterflies," she said. Another iguana walked past. "This place is fun, but I think it’s time for us to leave. The sun is starting to set and I don’t relish the thought of staying in here during the night. Who knows what happens then," Bonnie smiled, teasing Bruce. "You’re right. It might be kind of scary. We could be sleeping and one of those frogs could eat us or something," Bruce shivered. "How do we get out of here?" "Follow me," Bonnie said. Some children were heading towards the exit. "Land on their shoulders or their back and hold on tight." As the children left, Bonnie and Bruce secured themselves to a coat and soon found themselves outside. They flew up to a nearby tree. "Wow! That was really pretty and maybe we can come back again someday. Do you think we could, Bonnie?" Bruce asked. "Sure, but for now, let’s find a big flower that we can curl up inside and sleep for the night. I’m tired," she yawned and the two butterflies fluttered away up the rolling hills.